In my A Homemade Life review on Friday, I listed a few new foods I was planning to try over the weekend. 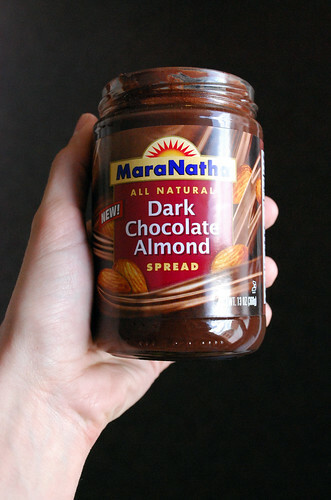 I thought I'd start by reviewing the MaraNatha Dark Chocolate Almond Spread that has swiftly made its way to the near-top of my favorite treats list. How does it taste? Well, the words on the jar describe the texture quite accurately: Velvety. It's sweet, but not too sweet, and just a touch salty (which I must admit is my favorite combination). I would say the texture is really the best part. It just reminds me of brownie batter -- without having to mix all those ingredients together. To me, there are few things better than brownie batter. Ingredients: Dry Roasted Almonds, Evaporated Cane Juice, Palm Oil, Cocoa Powder (alkalized), Non-Fat Dry Milk, Canola Oil, Soy Lecithin, Natural Vanilla Flavor, Salt. Contains: Almonds, Milk, Soy. May Contain Peanuts and Other Tree Nuts. I love that it's all natural and -- per two tablespoons serving -- this spread has 4 grams of protein (versus 2 in Nutella), only 9 grams of sugar (versus 20 in Nutella), and matches Nutella on its sodium content (15 grams for both). I think we're already established that I absolutely LOVE the taste and texture. It goes well on fruit, in oatmeal, and straight out of the jar on a spoon (or finger -- again, I have no shame). I'm not too thrilled with the list price. Though I purchased my jar (OK, jars -- as in two) on sale for $4.99 at Wegmans. The stuff usually runs between $6.99 and $7.99. So, I dare not develop a strong habit. I'm also not happy it isn't vegan. I'm not vegan, but I'm sure many of you who are don't quite understand why there needs to be milk in the ingredient list. I don't get it either. To check out the full range of MaraNatha Nut Butters, just visit their website. Has anyone out there developed a cheap, quick, easy, and delicious (and VEGAN?) recipe for a chocolate nut butter? I'd love to make some of my own . . . but whenever I've tried, I've had mixed results. And usually end up spending the same amount (or more) than I would if I just bought a jar. Just leave a comment or email us at neverhomemaker@gmail.com.